Save an extra CDN$ 41.31 (63%). Buy the Kindle Edition instead. The 2014 release of Microsoft's SQL Server Integration Services provides enhancements for managing extraction, transformation, and load operations, plus expanded in-memory capabilities, improved disaster recovery, increased scalability, and much more. The increased functionality will streamline your ETL processes and smooth out your workflow, but the catch is that your workflow must change. New tools come with new best practices, and Professional Microsoft SQL Server 2014 Integration Services will keep you ahead of the curve. SQL Server MVP Brian Knight is the most respected name in the business, and your ultimate guide to navigating the changes to use Microsoft SQL Server Integration Services 2014 to your utmost advantage. SQL Server Integration Services is a complex tool, but it's the lifeblood of your work. You need to know it inside out, and you must understand the full potential of its capabilities in order to use it effectively. You need to make sure the right architecture is in place. Professional Microsoft SQL Server 2014 Integration Services is your roadmap to understanding SSIS on a fundamental level, and setting yourself up for success. 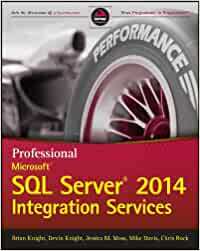 Start reading Professional Microsoft SQL Server 2014 Integration Services on your Kindle in under a minute. Renowned SQL Server MVP Brian Knight and his expert co-authors teach you best practices for using all of the features of Microsoft SQL Server Integration Services (SSIS), including the latest enhancements introduced with the 2014 release of SQL Server. In addition to technical updates and additions, the authors also add a new set of best practices for effective use of SSIS, more case studies, and tutorial examples to illustrate advanced concepts and techniques. 5.0 out of 5 starsThank you! Product as described, Fast shipping! Thank you! Product as described, Fast shipping! I own the hardcover version of this but left it at home while on a 2 week project. I needed the reference, so I bought the Kindle version. I shouldn't have wasted my money. The conversion from book to Kindle did not go well for this book. Headings and references are impossible to follow. To me, it was virtually unusable and the trying to read it through the cloud reader wasn't really any better. I guess I learned my lesson about buying Kindle versions of computer books. A good and useful book but typical of this series, contains a lot of detail and sometimes difficult to find what is applicable to what you are doing. This is the classic SSIS manual. It has been updated with each release and is still my favorite and I've been developing in SSIS since it was released.